Location: Road bridge carrying B4409 over River Ogwen, by entrance to Penrhyn Quarry. Partly in Llandegai Community. Road bridge of uncertain date, probably C18, widened 1805, carrying the old road to Llandegai and Bangor across the Ogwen. The bridge is said to have been ruinous in the 1790s and enlarged 1805 though present S side looks of c1830. Rubble stone three-arched bridge doubled in width in early C19. Original N side has low rough stone voussoir arches and rubble parapet. NW end has been splayed perhaps in early C19 giving overhang to right half of centre arch and refacing to right arch. Added earlier C19 S side has 3 shallow elliptical arches with cut slate voussoirs and raised arch rings. String course above. Low cutwaters and raised piers between arches, string course broken forward over piers. Rubble parapet with edge-on stone coping. 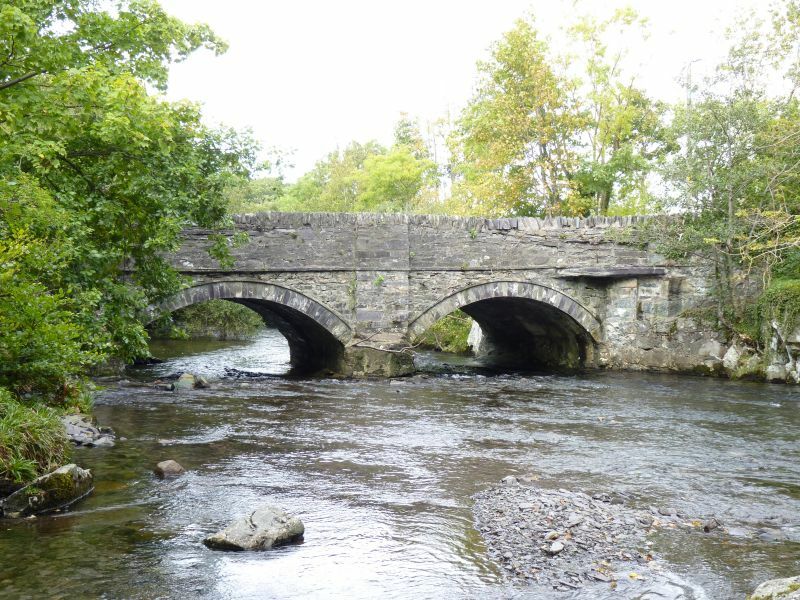 The oldest of the Ogwen bridges. Spanning the Afon Ogwen a little to the west of the A 5 on the minor road between Braichmelyn and Coed-y-parc; picturesque location. Situated in cul-de-sac off B 4409 road which runs W from A 5 S of Bethesda, to Penrhyn Quarries.